Create a bespoke Christmas gift for key stakeholders for under $10. ASICS were looking for ideas. They always give away a bottle of wine, but wanted to add a little branded ‘something’ to go with the wine. We were up for the challenge! In thinking of how we could make it unique for them, we wanted to up the ante with their gift of wine and make the gift functional and reusable The one thing that is synonymous with their brand is their ‘cool dry’ fabric with the distinct pattern. 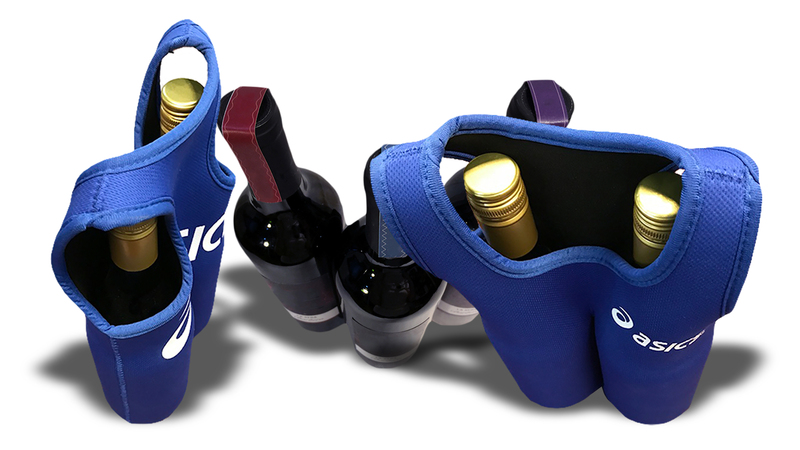 We hand drew a DOUBLE WINE CARRIER fashioned from their distinct running singlet. The carrier was constructed of neoprene with their ‘cool dry’ fabric as the outer. A production sample was produced and the client loved it. The finished product surprised and delighted their clients!